We've been to a lot of beaches and the Maldives Islands is the clear winner of the world's best beach holidays. And there’s one beautiful island in the Maldives that has it all…powdery white sand fringing a stunning aquamarine lagoon, good accommodation including quality meals that’s outstanding value in the Maldives, and even a restaurant overlooking one of the world’s best surf breaks. Chaaya Island Dhonveli has the added advantage of its location only 20 minutes by speedboat from the Maldives capital Male, allowing you the privacy of your own tropical island, while not being stranded on a remote island hours away from everything. When you step off the Chaaya speedboat and onto the white sands of Chaaya Island, you’ll fall in love with the swaying palms, the happy smiles and the layout of this Indian Ocean paradise. The Beach Bungalows here are truly outstanding…straddling the white sandy	beach with the most beautiful views up and down the sparkling lagoon. 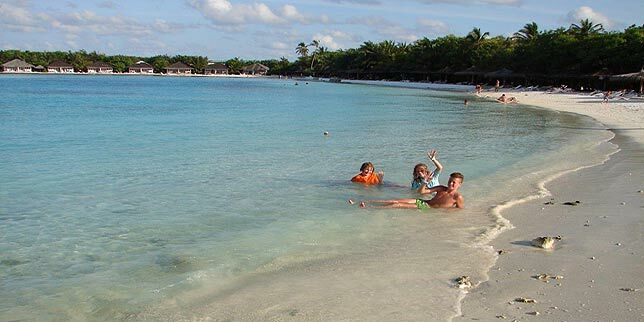 Walk 5 minutes down the beach and you’ll see the start of the Over Water Bungalows that so many visitors love. Seclusion, yet a sense of belonging. And that’s what makes Chaaya Island so special. Different nationalities come together effortlessly because of the relaxed feeling on this island. It’s a fascinating story of how Atoll Adventures in Australia came to organise surfing holidays here. Australian surfer Tony Hinde was shipwrecked nearby in the 70s after hitching a ride on a yacht from Sri Lanka to South Africa with surfing mate Mark Scanlon. The Californian captain turned out to be a nightmare, but Tony couldn’t believe it when daylight revealed the perfect island paradise. Not much was known about this speck in the Indian Ocean and when the two adventurers discovered perfect peeling waves on these islands, they kept it secret for years. When a passing yacht came into view, they would quickly scramble to shore and hide behind palms so no one would realise the potential of the perfect waves were. Such was his love of this natural paradise, Tony Hinde stayed and assimilated into the local Muslim culture, so much that he married a local girl and changed his name to Tony Hussein Hinde. But living on a simple diet mainly of rice was tough, so Tony started bringing back exotic shells from Sri Lanka to sell to the occasional seafaring Europeans visiting the Maldives. When the Maldivian government stopped shells being sold, Tony had to survive, forcing him to finally let the islands’ surfing secret out and start responsible surfing tours. He was granted use of Dhonveli Island and when well heeled surfers discovered there was a tropical escape with the best waves in the world for their exclusive use, tourism here was born. Tony and his wife Zulfa developed Chaaya Island Dhonveli from a surfing destination into an internationally-renowned resort, now popular with holidaymakers from countries as diverse as China to Israel. Sadly Tony Hinde died from a heart attack while surfing the Pasta Point waves he loved so much in 2008. His long-time Australian friend Ian Lyon at "Atoll Adventures" (www.atolltravel.com) continues to put together the world’s best surfing packages as well as great value diving trips including flights and meals. Tony Hussein Hinde’s impact on the Maldives has been so great that a major motion picture about him called Serendipity has just been released on DVD, available from the Atoll Adventures website. 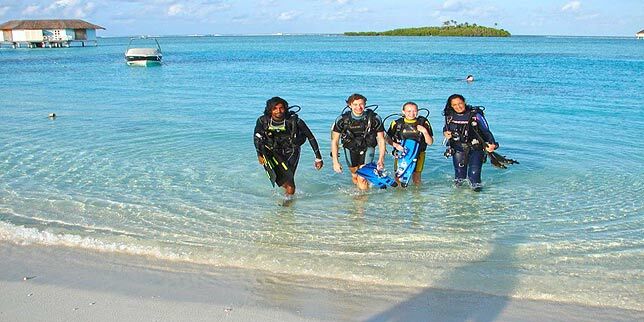 The natural coral on Chaaya Island is now a major attraction to divers from around the world at this Paadi-certified diving site, while many people come simply for the seductive combination of sun, sand and sea. Even the great value Garden Villas on Chaaya Island have an ocean view over the world-famous Pasta Point surf break. They also see across to the Sultans and Honky’s surf breaks only 5 minutes away by speedboat. When you see these crowded waves nearby, you realise the value of Pasta Point…the only tropical paradise in the world where exclusive access is granted to a maximum of 30 surfers staying here only (and usually only a few of these are surfing at any one time). The freshly-caught seafood served at the three restaurants here on Chaaya Island Dhonveli is outstanding, as is the gentle and friendly service from the smiling Maldivian locals. They particularly enjoy entertaining guests with the Maldivian cultural show at one of the beach restaurants after sunset, inviting visitors up to dance with them. Nightly entertainment also includes disco nights, live music and fun themes. The reality in the Maldives is that many resorts are more than US$1,000 a night, and then you have to buy their expensive meals and drinks as well. Here at Chaaya Island Dhonveli, it’s less than half that for an Atoll Adventures package with all meals and airfares included. You can live like and eat like a king, and still have valuable money left over. Phone "Atoll Adventures" on +61 3 5682 1088 for more Maldives surfing holiday information. Accommodation near Maldives Islands beaches. Best beach holiday Maldives Island travel was written by dedicated photo journalists, published and edited by the Best Beach Holidays Travel editor. Contact Best Beach Holidays to submit your beach holiday articles.